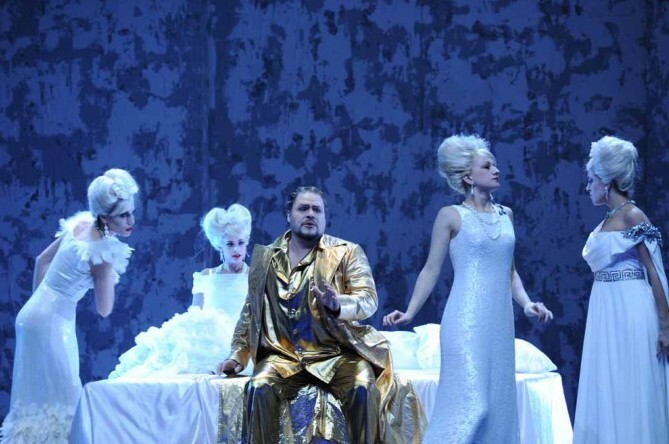 I rather liked Richard Strauss's Die Liebe der Danae, another opera I had never seen before. I will try to explain the plot. King Pollux, who lives in a palace filled with classical art, has fallen on hard times. His creditors are there to haul off all his belongings. A piano is lifted into the air where it turns throughout the opera. Hmmm. According to the plot summery, Danae dreams of gold falling from the sky. In our production it was sheets of paper. We thought perhaps they were sheets of music but couldn't tell. They think they can save things by marrying Danae off to Midas who has the power to turn anything into gold by touching it. Midas shows up wearing gloves and pretending to be Chrystopher, the servant of Midas. He and Danae fall in love. Jupiter then shows up disguised as Midas to woo Danae. He doesn't know he is already too late. His four ex girlfriends also show up: Semele, Europa, Alkmene, and Leda who all seem like four Barbie dolls. Danae is more of a real girl. First the real Midas turns everything into gold, including Danae when he tries to kiss her. Then Jupiter turns her back into a human. She chooses Midas over Jupiter even though he has lost his power to turn things into gold and she will live in poverty. Jupiter gets angry and blows everything up. The other gods laugh at him. There is a lot of beautiful love music in this opera, but it isn't done often enough to result in very polished performances. All seemed to be struggling with their roles. The orchestra was much too loud, which contributed to the problem. It was nice to see Mark Delavan again. At the end of the opera Danae looks up--at last someone looks up--and notices the piano floating in the air. I kept worrying it would fall on someone. She knows we are in the tumbled down old palace and that this is her piano. She finds the piano stool and sets it down in its former place. She finds the suitcase of treasures from prosperous times. She knows she is at home and is happy with her present life. This one I could do again. The role of Danae is very sweet. Manuela Uhl also sang the sister in Elektra.